Wolf Creek Crafting: You are Precious! During the month of October, Splitcoast Stampers is sponsoring Hope You Can Cling To, a card drive for breast cancer patients & their family members at UT MD Anderson Cancer Center. There will be all kinds of challenges all month, including challenges in the member company forums. 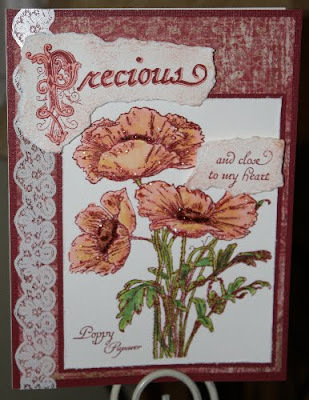 For this week's Crafty Secrets challenge, Lori Lynn challenged us to use pink on our cards. I used the new Poppy set from CS to make my card. We have real poppies in our yard every year that bloom this beautiful tea rose color.